Why CSI Compressco Rotary Screw Compressors? What are the benefits of using a CSI Compressco package? Over eighty units in the 1,000 horsepower and larger range have been built and are successfully operating; thirty-five of those are Caterpillar G3516TALE screw packages. CSI Compressco has also designed and manufactured Caterpillar 3608 Two Stage packages, steam turbine drive packages, and hundreds of high efficiency electric and engine drive refrigeration packages. The CSI Compressco control system is unequaled in the gas compression industry. Our customer can choose from several automated systems – Mechanical, PLC or processor based. The mechanical controls are patented and the control software is CSI Compressco copyright protected. Our packages have the ability to operate from a deep vacuum to a positive pressure application with tremendous fluctuations in volume compressed. The Frick rotary screw is equipped with automatic capacity control, giving it the ability to reduce throughput from 100% down to 12% of capacity (on most frames). The Frick rotary screw is also equipped with variable compression ratio control, which allows the unit to adjust efficiency while running as operating conditions change. The CSI Compressco gas/oil separator is a patented, high-efficiency design that minimizes operating costs with low oil usage. This allows CSI Compressco to provide the only oil usage guarantee in the industry (1 gallon per 10,000 MCF for discharge pressure below 100 psig at normal discharge temperatures). The CSI Compressco oil system is designed for a wide range or conditions to accommodate varying pressure changes. This can allow the customer to operate outside of the normal design conditions for an extended amount of time and not have any complications with the operation of the unit. The type and temperature of the oil are carefully selected via the specific gas analysis to ensure trouble-free operation. The CSI Compressco cooler design allows for ample cooling under a wide range of operating conditions. 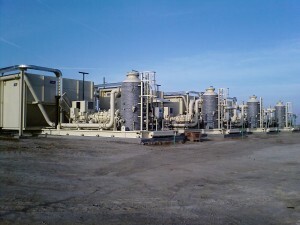 Gas cooling is designed for a 20 degree F approach to 105 degrees F ambient. Suction scrubbers are oversized and equipped with internal blowcases (standard) for low pressure or vacuum service. The scrubber sump is heated with engine jacket water to prevent freezing of liquids. Gas piping is engineered for minimal friction losses yielding high efficiency.